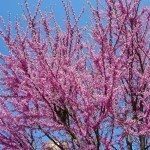 My Redbud was planted last July, less than a year ago. It was full and green, and this Spring it did have brilliant blossoms. There are lots of little pods, and leaves are coming out but very slowly and not every branch is covered. I water regularly, am in the Southwest, but am concerned it will never get all its leaves. Is this normal or should I be worried? Thank you. How much sun does this spot receive? This tree requires full sun to thrive. I also notice that it is planted very close to that building. Make sure that there are no water lines nearby. Roots can invade these causes quite a bit of damage. In some instances tree roots can cause structural damage as well. Can you give me as much info about that spot that you can think of? This will help me to find out, exactly, what is going on here.